Many people from the Alliance died in the war, but there was a clan in the Alliance that did not lose anyone. That clan was the Nangong clan, the ones who were watching the battle from afar. They were able to retreat without losing a single man in the war. Nangong Yubin. He was staring directly at the middle aged man in front of him. The middle aged man was Yubin’s father, the leader of the Nangong clan. His name was Nangong Shiyu (南宮勢玉). That man looked at his third child, and smirked. Nangong Yubin replied with a depressed expression as he thought of Peng Ga Ho. Unlike the Nangong clan, the Hebei Peng Clan, who showed an unusual amount of obsession in this affair, suffered from heavy damages. He was worried about Peng Ga Ho. Nangong Yubin hesitated a bit. Then, he spoke with a serious voice. Indeed. The Demon Church was truly overwhelming. Nangong Yubin shook his head. Nangong Shiyu poured some tea into the cup in front of him. He had three sons, and two daughters. Thankfully, all of the children were blessed with quite a lot of talent. But there was a single person that stood out even amongst children like this. That would be his youngest child, Nangong Yubin. Nangong Shiyu, who recognized the boy’s talent from a long time ago, treated his youngest child dearly. He knew that this boy was the one that would lead their clan into the next generation. This truly came as a surprise. Didn’t Yubin’s father harbor immense hatred for the church? A man like that didn’t even want to fight? It really was something unexpected. Nangong Yubin didn’t say anything. There was no way that that was the only reason his father was unwilling to fight. His prediction was indeed correct. Nangong Yubin gulped. He felt uncomfortable all of the sudden. Nangong Shiyu told his son about what the Dao Emperor did in order to get the clans motivated enough to fight. Nangong Yubin’s face turned dark. Many people died due to this war. Those deaths were caused simply because of a single man’s greed? Wasn’t that too sad? Nangong Shiyu. He still didn’t know the Dao Emperor took the Pope into account in the plan. He looked into his child’s face, and asked a question with an excited face. Nangong Yubin bitterly smiled before replying. His father had a lot of hopes for him. Because of that, he never betrayed his father’s expectations since the time when he was a young child. But that was about to change now. Nangong Shiyu paused when he heard his son’s words. He looked at his son with mysterious eyes, and opened his mouth. Nangong Yubin scratched his cheeks, and spoke. Nangong Shiyu made a satisfied face. His son definitely grew up. It was definitely worth it to make his son come all the way here, the hard way. In truth, there was someone watching over the children as they traveled, even if they might’ve not realized it. Nangong Shiyu dispatched someone just in case something bad would happen. The Nangong clan thought that this was a little suspicious. They thought the Peng clan would’ve dispatched someone for sure, but there was nothing of the sort. Nangong Shiyu let his thoughts unintentionally slip. He made a troubled face for a moment, then quickly tried to change the subject. Nangong Yubin thought of Peng Ga Ho for a moment, then spoke with a serious tone. The children of the five great clans. The interaction between the children of the clans were restricted to a certain extent. Thankfully, it seemed that having Peng Ga Ho as a friend did not cross the restriction in the eyes of the clan. Nangong Yubin nodded, and stood up. He was off to meet Peng Ga Ho. Nangong Yubin flinched when he saw Peng Ga Ho. The boy was beaten black and blue. Nangong Yubin was snapped awake from Peng Ga Ho’s words, and followed Peng Ga Ho inside. Peng Ga Ho smirked when Nangong Yubin said this. Nangong Yubin asked Peng Ga Ho a question with a smile on his face. 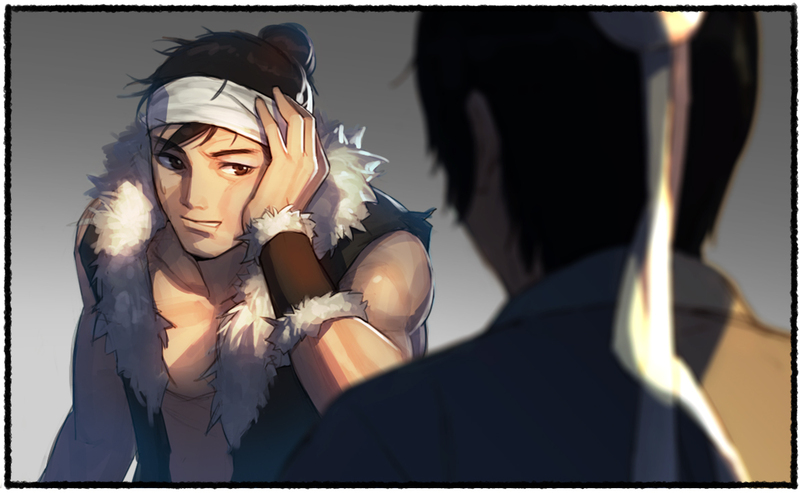 He heard that the personality of the Peng clan’s chief was quite violent, but to think that it was to this extent. Peng Ga Ho smiled when Nangong Yubin looked at him with sympathy. Peng Ga Ho grinned, and shook his head. An unexpected response. When Nangong Yubin put on a confused expression, Peng Ga Ho began to explain what he meant as he brought his teacup to his mouth. Peng Ga Ho was an unexpectedly optimistic person. Nangong Yubin thought that, and then tried to remember just how much damage the Hebei Peng clan took. The Hebei Peng clan. About three hundred experts came from that clan in order to take the Moon Edge Blade Technique, and about one hundred died in the hands of the Demon Church. As they took such a massive hit in the battle, they had to retreat to the Gansu Branch of the Alliance with corpses of their family, and hold a funeral. Actually, even retrieving corpses was a hard task. That was because most of the corpses there were either amputated, or was disfigured to the point of no recognition. Nangong Yubin nodded when Peng Ga Ho said this with a grin. The Heavenly Demon Church. They were truly frightening. Especially their leader. It wouldn’t be an exaggeration to call the Pope a demon. The countless drops of concentrated energy that fell from the skies with a single sweep of the hands. Just what kind of a martial technique was that? Each time the Pope swept his hands over the battlefield, countless people died. Right. The Pope was smiling. The Pope was killing many people with a joyous smile on his face. A one-way slaughter. The Pope right then looked truly terrifying. It was as if the Pope was a manifestation of fear itself. Peng Ga Ho spoke while Nangong Yubin was reliving the terrifying battle. The Godly Monk, Kongye. He used the Lion’s Roar (獅子吼) in order to wake everyone from a trance of fear, and managed to get the attention of the Pope while everyone escaped. Thanks to him, many people were able to get out alive. That man was his savior. Peng Ga Ho, who had been thinking the same thing as Nangong Yubin, finished his tea, sighed, and spoke. The Demon King, Gongson Chun Gi. That man showed true fear to everyone on the field. Even Peng Ga Ho, the boy who was usually all confident and prideful, was suppressed in an instant. Not even being able to consider taking revenge. Peng Ga Ho had to sigh because he knew his limits. The two stopped talking for a while. They had to think of something on their own. Right then, Peng Ga Ho spoke after fidgeting a bit. Nangong Yubin smiled bitterly. They had been observing the battle from afar, hidden from everyone else. They were afraid that their family members might recognize them if they got too close to the battle. When the dragon ascended, the Hebei Peng clan were the first to move. Thanks to that, they were the ones to clash with the experts from the Heavenly Demon Church first. When blood spattered, and the field turned chaotic, Peng Ga Ho became enraged and tried to jump into the battle. Nangong Yubin was the one that prevented him from doing that. The boy had pressed Peng Ga Ho’s veins, and made him completely immobile. When he thought about it now, Nangong Yubin’s decision was a wise one. They didn’t have the strength to survive in the chaotic mess of the battlefield, nor did they have the ability to dodge the Pope’s attacks. He almost managed to die a dog’s death. Nangong Yubin stared at Peng Ga Ho, and smiled with an exhausted face. A cold, determined voice. Nangong Yubin closed his mouth when Peng Ga Ho said this. Satisfied with just living? There was no way that was going to happen. If he got satisfied with staying alive, the people who died in the war would’ve truly died a dog’s death. Peng Ga Ho rubbed his swollen lips, and opened his mouth. He had to get strong. The things they went through in this event were enough to set a fire inside their hearts. Nangong Yubin tried to say something, but gave up. He knew that what Peng Ga Ho was trying to do was unspeakably hard. But there was no choice. There was no choice to not follow this path. That was the responsibility of those in the five great clans. That was the responsibility of the heirs. Then, Nangong Yubin turned his head sideways and muttered something in a small voice. Peng Ga Ho flinched when he heard this. Peng Ga Ho quickly tried to control his facial expression as he swore in his mind. He actually was considering that a little. The Pope simply was that strong. Peng Ga Ho thought of the Pope, and made a depressed face. Revenge seemed so far and distant. No mention of Cho Ryu Hyang…hm. Well, now they know the horror, maybe they’ll stop, or leave them alone, for once! I wonder how they’ll react when they find out who the next pope is. thanks for the release 🙂 ! This was a good chapter. It’s rising action to the event of them finding out about the heir. Indeed, gets your blood boiling.